Thanks, I am drafting a reply which may take a while for me to wrap up, not because it is going to be a book size reply, but becasue of all my other engagements. All I can say right now is that I think you're reading way too much into my critique of one specific argument, but it'll be clearer when I post the entry. I think it's an important point to make that we can't let people who misunderstand logic and fallacies dictate how we construct our arguments. Just because someone who doesn't understand ad hominem might accuse us falsely of engaging the fallacy doesn't mean we need to completely remove all non-rational elements from arguments just to be sure nobody falsely accuses of of fallacious reasoning. To do that is to capitulate to ignorance rather than to correct ignorance. 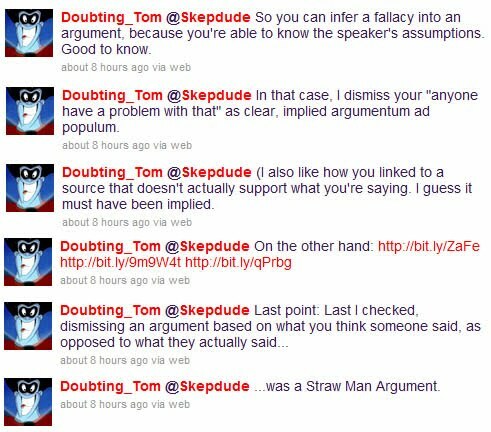 When someone misunderstands a fallacy, that's a teachable moment, not at "rephrase the argument to talk down to the guy who doesn't get logic" moment (not that I'm accusing Skepdude of that attitude; it's just the only way I could think of phrasing what's on my mind).Would it be nice to live in a world where pure reasoning was all you needed for effective rhetoric? Yeah, I suppose so, but in that world we wouldn't be having this disagreement because people could easily tell the difference between a fallacy and something that only bears passing resemblance to a fallacy. The thing about logical fallacies is that they exist in the structure of an argument. This is especially true about formal fallacies like affirming the consequent, where any argument of that structure will always be invalid, but it's also true about informal fallacies, most of which rely on non-sequiturs, because the non-sequitur premise (the personal attack, in this context) is essentially a broken part in the structure of the argument. "Jenny McCarthy uses botox" does not entail "She is wrong about vaccines" any more than "If P then Q; Q" entails "Therefore P."The basic point is that unless you can point to the underlying structural problem with the argument, the reason the premises do not entail the conclusion (either because the structure is fundamentally flawed or because there is no logical connection between one or more of the premises and the derived conclusion) then there is no fallacy. Fallacies can only be inferred if the structure of the argument is implied in what is being said. Well Don, if there is any "talking-down" it is certainly not coming from my end. Don't you think you're comming to unwarranted conclusions, before you've heard my side of the story? But then you and I seem to be on the same page. You say "Fallacies can only be inferred if the structure of the argument is implied in what is being said." which is exactly what I've been saying, which I understand is a bit wishy-washy, but on the other hand anyone can conveniently leave out the "therefore X is wrong" part and be immune from criticism. Sometimes things are implied, even if they're not spelled out in words. Like I said, I didn't at all mean to say that you were talking down to people or that you endorse that.But like Tom says, without the text, any guess as to what is implied is speculation, and in situations where someone clearly separates their argument from their insult, there's simply no fallacy to be claimed, but a teachable moment for anyone who claims one.I don't doubt that we agree on this, I think we just emphasize things differently.